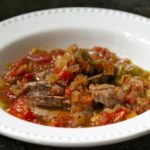 This recipe for slow-cooker beef brisket was inspired by a dish served in my office cafeteria recently. After going back to work full-time a few months ago I have had to contend with the decision to eat the food there or not. The cafeteria is beautiful and has a lot of variety. Some of the dishes, like their beef brisket with peppers, are delicious. But I have taken to referring to the cafeteria as “Gluten City”. There is bread or wheat flour or soy in some form or other in just about everything. I usually opt for the salad bar but even the grilled chicken there is suspect because it has a coating on it. There are many days when I have a reaction to something eaten in the cafeteria even when it is a rather plain salad from the salad bar! In addition to not grasping the importance of labeling foods for people with sensitivities, this particular office cafeteria has fallen victim to the notion that “fat free” or “low fat” is always optimal. Other than olive oil at the salad bar, there is not a lot of healthy fat to be found – not even nuts or yogurt with more than 0% fat content. I have recently noticed the “light cream” option with the coffee has changed to Half-and-Half. 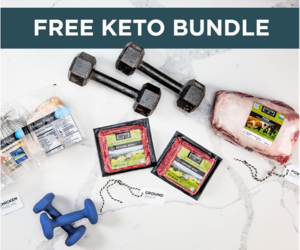 They think they are doing everyone a favor with these low-fat, high carb offerings. Taking my lunch to work has become a new priority for me. 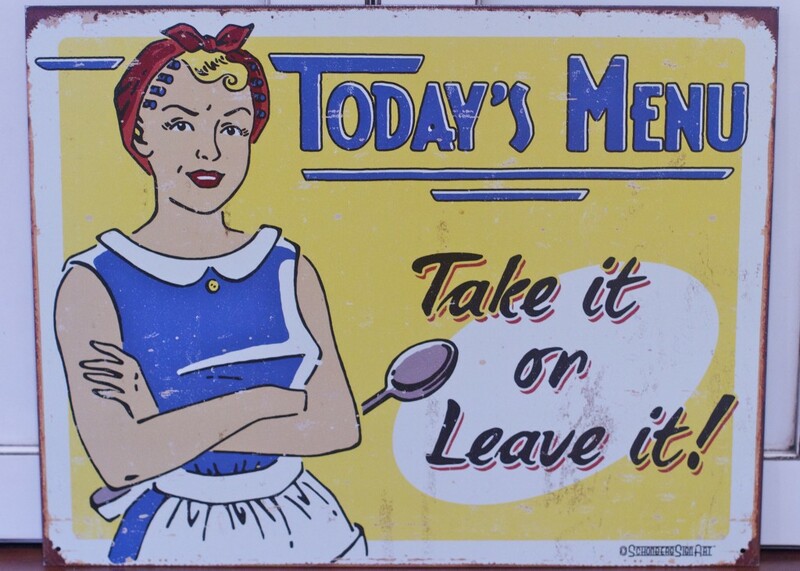 I need things that can be cooked in advance in larger quantities and packed up for lunch the following day. This slow-cooker beef brisket recipe fits that bill. It’s really easy and can be thrown together in the morning before work. Do you like my sign? We found this in a store recently and it took about two seconds to realize we had to have it. I bet you could find it online if you wanted it in your kitchen. It sort of sets a tone for our family, if you know what I mean. If you are using conventional beef (i.e. not grass-fed) trim the excess fat from the brisket and place it in the slow-cooker. Add the diced onions, garlic, sliced bell peppers, hot pepper (if using), salt, black pepper and red pepper flakes. Pour on the canned, diced tomatoes or your diced fresh tomatoes. Check seasonings and add more salt/pepper if needed, to taste. If you like to imagine yourself with your own show on the Food Network then you could take the extra step of searing the brisket in an oiled hot pan before throwing it in the slow-cooker. 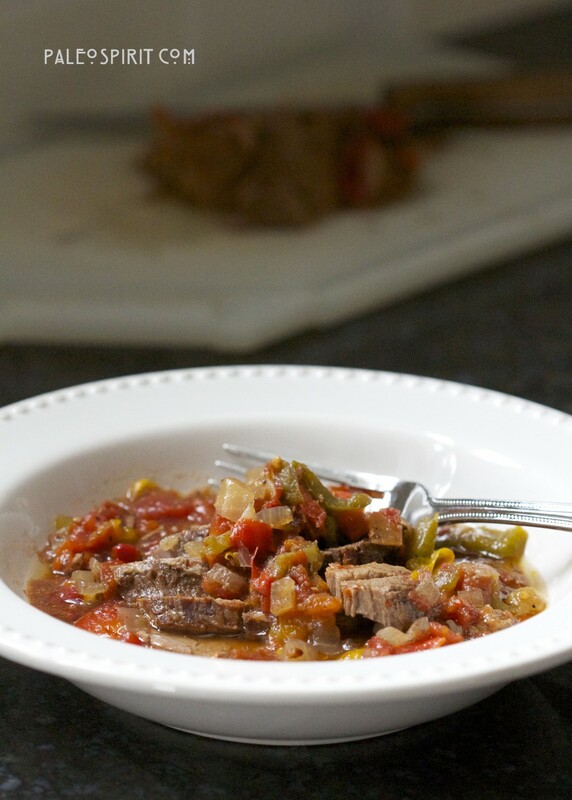 The browned beef always imbues the dish with a richer flavor. In this case, I do not bother with that step. For one thing, it’s not absolutely necessary. Secondly, it takes more time than I have in the mornings. And finally, I do not wish to smell like seared brisket while at work. Thanks for stopping by! 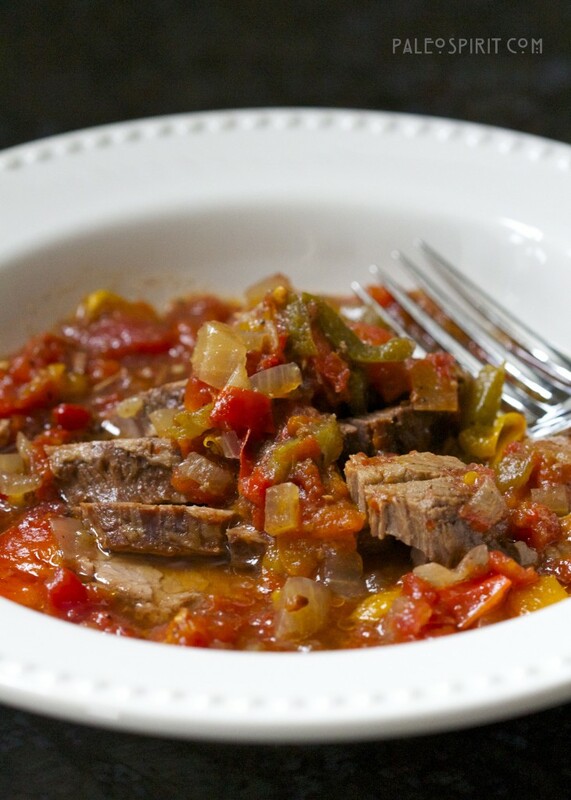 Let me know if you like this easy slow-cooker beef brisket dish. 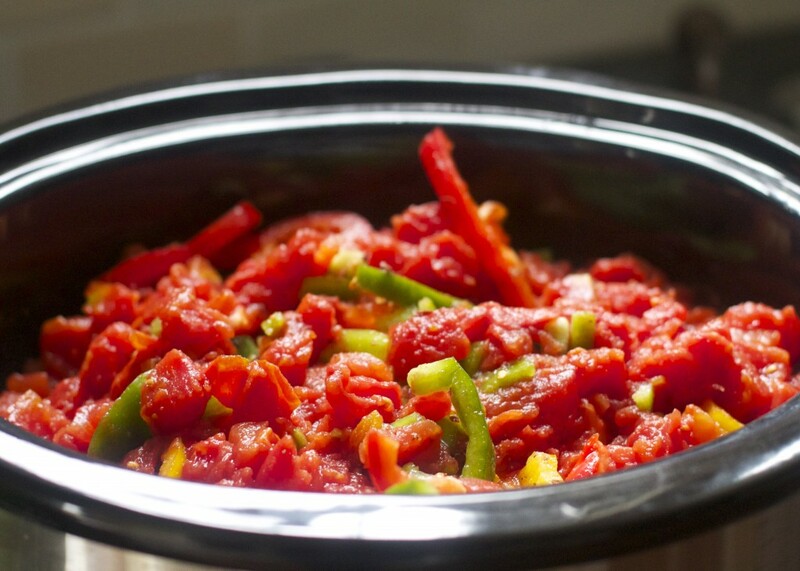 If you are looking for a slow-cooker. 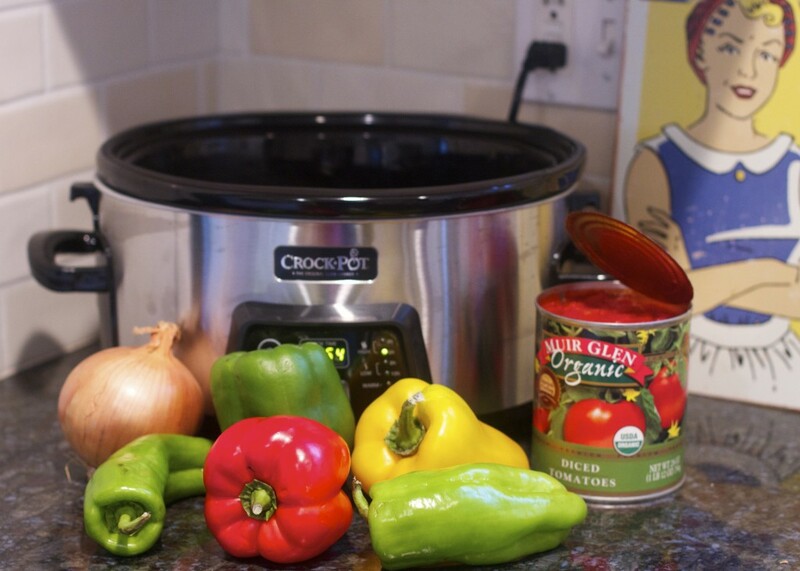 This Crock-Pot brand slow-cooker is similar to the one I use. 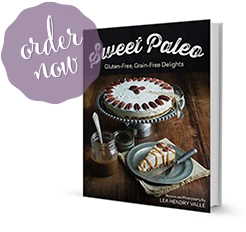 Check here for more of my paleo dinner recipes/main dishes. Find Paleo Spirit on Facebook and Pinterest. 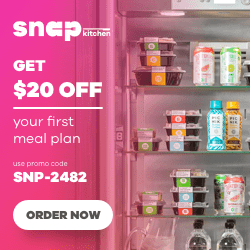 For free recipes to your email address, sign up below: You will receive a confirmation message so if you do not see it immediately, check your spam folder. 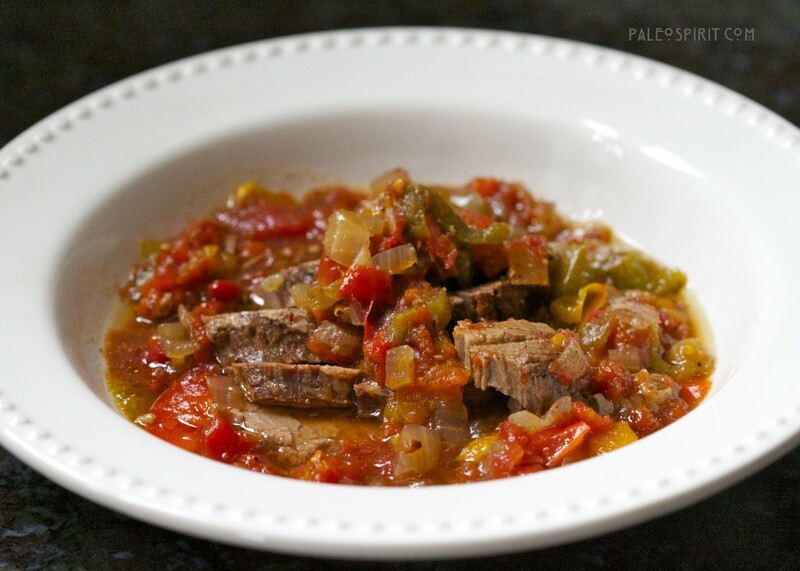 6 Responses to "Slow-Cooker Beef Brisket: Easy Paleo Recipe"
That looks wonderful! 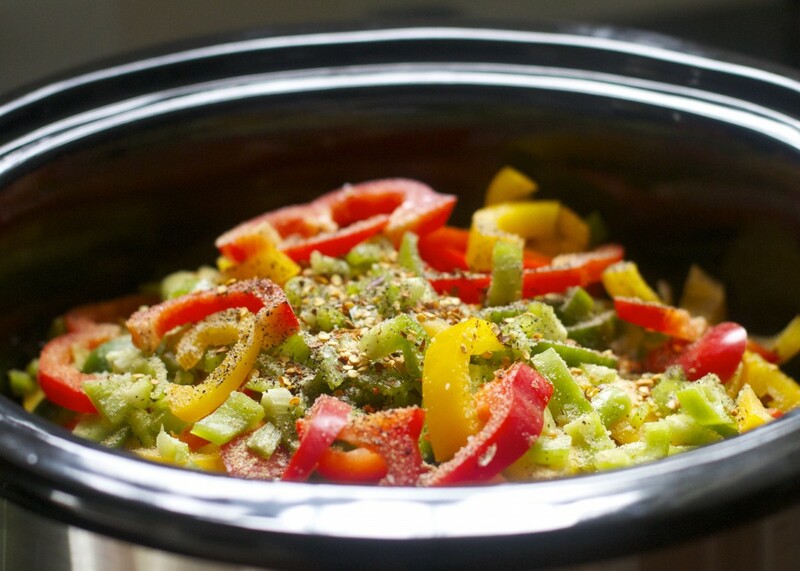 As a full time working person, I love slow cooker recipes! It’s hard to beat the simplicity and quality of such real food dishes! This beef stew looks yummy, Lea! It is sad how the real world doesn’t embrace real food and that we can’t stay safe eating even the simplest of foods in it, so to speak. I made this tonight for dinner, and OH MY Gosh!!!! It was so incredibly good and flavorful!! My husband absolutely loved it!! Thank you for sharing!! Looks good may make today. I’ve had a beef brisket sitting in my freezer for 10 months (last piece from side of beef) and had no idea how to cook it and found your recipe. This dish was a HUGE hit in our family! It’s on the “Keeper” list. I also didn’t change a thing but am sure you could easily add other veggies. Thanks for sharing! How would I cook this with leftover smoked brisket? would I put all ingredients in the slow cooker and cook for less time or all the ingredients except the brisket first? I would love to use the recipe to get rid of some of our leftover brisket. thanks.